If you are looking for commercial or residential scaffolders to erect scaffolding for your home or business, Airo can help. We operate in Chichester, Horsham, Worthing, Guildford, Arundel, Petersfield, Bognor Regis, Midhurst, Petworth, Portsmouth and throughout West Sussex. If you need a company to provide you with the highest quality work - no cheap equipment - for a cost effective and competitive price, then look no further than Airo. We have been providing all aspects of scaffolding work for over 10 years with staff that have over 50 years of combined experience in the trade. We have an excellent, friendly and professional team who will erect a safe and secure system for you. All the jobs we do, are nothing less than the absolute best. As a professional company we will be happy to give a free, genuine, no-obligation quote for a job of any size. We guarantee to offer better value scaffolder services than any of our current competitors. We often find that many of our jobs mean working with other tradesmen such as builders and decorators, which is great as it gives us the chance to work with others and get our name out there and known to other tradesmen, so that we can recommend each other for future reference. Our customers are the main priority and we will always recommend good and honest local tradesmen who we have worked with previously. We will also keep in touch with you regularly throughout our work, so that we can keep you up to date with the progress. If you are interested then please do not hesitate to call us today! Regardless the length of time or size of the job, we are able to help. 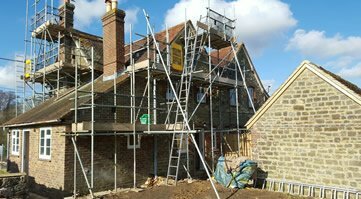 We have worked on hundreds of scaffold projects across West Sussex ranging from garage roof access projects to full housing developments and renovations. We always provide a fair price with a high-quality of work and this is evidenced by our Checkatrade reviews. Once you hire scaffolding from us, we are always available to answer any questions, make adjustments or arrange for when you would like the scaffold equipment removed. That's a fair question and one we would expect you to ask. Depending on the size of your project, hiring a company to install scaffolding can be expensive and nobody wants to waste or risk their money. We've built our business up over many years, mostly through word of mouth referrals. We started small and although we've grown, we are still family-run and are proud of the reputation that we've built and there's nothing that we would do to risk that. If you have any questions, please give Alan a call to discuss your scaffold project. We are very honest with our customers and if we think we are not the best company for you, or you could get a better deal elsewhere, then we will happily point you in the right direction of another company who could help. 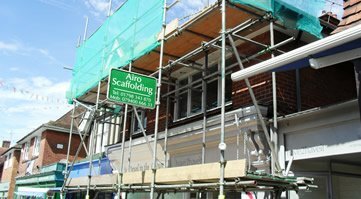 At Airo Scaffolding, we work with a number of different industries, assisting with scaffold installations. We are based in Chichester but operate in all of the local areas including Horsham, Worthing, Guildford, Arundel, Petersfield, Bognor Regis, Midhurst, Petworth and Portsmouth. We are lucky; because of what we do we are able to meet a lot of people in a wide range of fields. We work with a variety of local house builders, contractors, stonemasons, roofing contractors, surveyors, maintenance firms and repair specialists. The companies and organisations that we work with vary in size, too. We have erected scaffolding for charity events, such as local 5K races, through to major construction sites. Scaffolding is required for a whole host of activities, especially when access is required above ground. It’s a cheaper alternative to hiring a lift, especially when longer term access is required or a team of people need to move freely between floors and around the outside of the building. Each site is different but we enjoy working with the different people, in different industries, and fitting scaffolding to meet whatever need you may have. 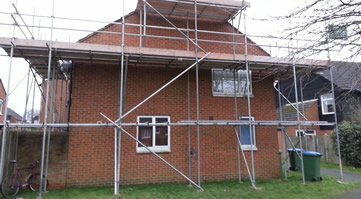 If you are interested in hiring scaffolding in Chichester or the surrounding areas, please get in touch. Just call Alan on 01798 368080 or contact us via our contact page. Scaffolds are used in most commercial and in residential projects when a building is involved. It is a tool that is just like any other and with all tools, accidents can happen. There are many reports of accidents and even deaths that result from misuse or improper training on this equipment. There were nearly a thousand deaths reported by EU-OSHA in only a three year period. These deaths could have been prevented if it were not for the employees not getting the training and using their heads when operating on this equipment. However, around 72% of these accidents are due to planks giving out or being struck by something that fell. This goes back to following safety codes in order to ensure your workers are not putting themselves in danger. The scaffolds bridging are not properly maintained. You need to be sure to check that your company or the company that you are working for has a plan for safety as well as a checklist on your job’s location. There should be someone that should be in a position to check all the scaffold safety precautions on your job site daily. Training for scaffolding is not only about using it, but being aware of the surroundings. It is also important to check for objects that may cause harm or dangerous wires. The scaffold should be checked at the start of your day and at the end, as well. It should also be checked if anything is changed or altered as you are working. There should always be toe-boards and guardrails. The guardrail should be at least six feet high. There are some specific scenarios that guardrails can be removed, but other than that there should always be guardrails installed. You can never really have too much safety when working with scaffolding. You should, as it is recommended highly to have a brace connected to it, in order to keep the scaffold secure. Watch the weight limits and be sure to follow them. Remember that different types of scaffolding have different safety requirements as well and you should follow whatever the requirements are for the specific equipment you are using.